Amother angle of living room. Short walk to the beach and marina. Rockley Park has it all. Beach, pool, boating, activities for the kids through to a quiet spa treatment. Restaurants on site, so no cooking necessary. Imagine arriving at your holiday home, all made up ready for your arrival. Towels and bedding provided, you are all set to open a bottle of wine and take a seat on the deck with beautiful sea views over Poole Harbour. What could be better than watching the world go by? 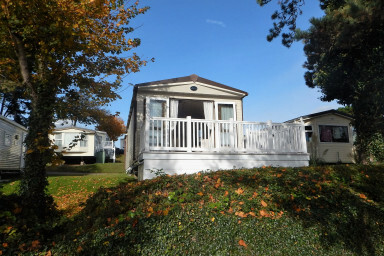 Our holiday home is sited in the premier 5-star Rockley Holiday park in the beautiful area of Poole Harbour, in Dorset. Rockley Park has it all, games for the kids, multiple swimming pools, a water slide for the kids (both young and old), and enough activity to set even the most active youngster to sleep well in the evening. If you are just wanting some time away, there are some great restaurants around the park. And some great shows and activities during higher season breaks for adults and kids. If you feel a bit of pampering is in order, there is a spa on site which offers various spa treatments to destress after a time at work. Everything you need is in reach of the holiday home. The kitchen / lounge is open plan, with the kitchen offering all the conveniences of microwave, integrated dishwasher and an integrated fridge / freezer. Along with a gas oven and hob. The lounge is equipped with a number of sofas, and a pull out to increase the number of guests to 6. There is also an electric fireplace for those colder winter nights. There are two TVs, one in the master bedroom and another in the lounge. The entire holiday home is double glazed with gas-fired central heating which is thermostatically controlled. Outside the holiday home you have enough parking space for two cars. 'Fun Works Passes' will have to be purchased from the Rockley Park office to benefit from what they have to offer. Internet access at the park is reasonably expensive, and quite limited. We have a Mobile Broadband hotspot which we can provide for you if you need it. It will allow up to 10 devices to attach to it. If you are wanting to use this service you must let us know at the time of booking. The cost for this will be £35.00 per booking. You will be limited to 10GB of transfer without having to top up again. Any unused allocation will not be refunded.